Five o’clock shadows intact, Richard Armitage, James Marsden and Luke Evans attended movie premieres last night in Madrid and London. 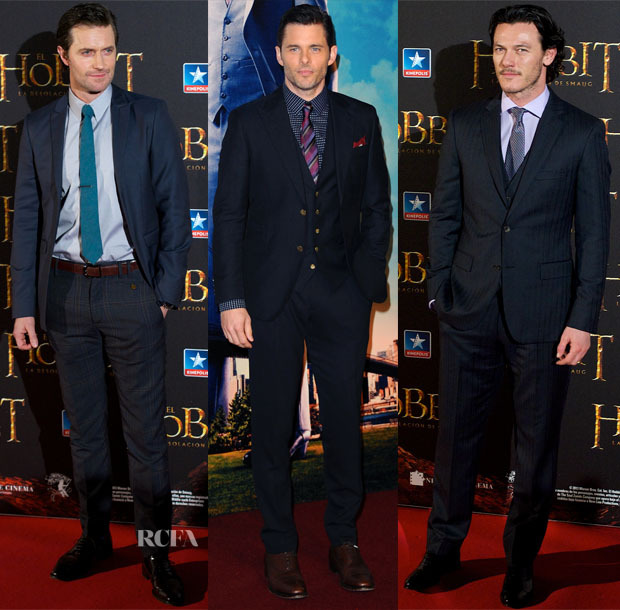 Richard Armitage: For the Madrid premiere of ‘The Hobbit: The Desolation of Smaug’, the British actor again opted for various shades of blue. Keeping his Unconditional blazer, the actor added Vivienne Westwood plaid trousers to the ensemble. In lieu of a pocket square for a pop of colour, the actor selected windowpane pants that were navy and grey with a touch of turquoise that matched his tie. A brown belt and dark brown shoes pulled the look together. James Marsden: Wearing a midnight three-piece Dolce & Gabbana suit for the London premiere of ‘Anchorman 2: The Legend Continues’, the actor hit all the right colour notes by punching up his look via a red trimmed pocket square, pink and purple striped tie and check shirt. Luke Evans: Selecting a shirt with a wide neck collar, as the current menswear trends dictate as stylish, the ‘Fast and Furious’ actor went with a dark tone on tone three-piece Boss by Hugo Boss pinstriped suit for the Madrid premiere of ‘The Hobbit.’ Though the knot of his tie could have been a bit thicker, the overall look is a decent one.